How cute is this? Don't know what to get the record nerd in your life who seemingly already owns ever record know to man? How about this! 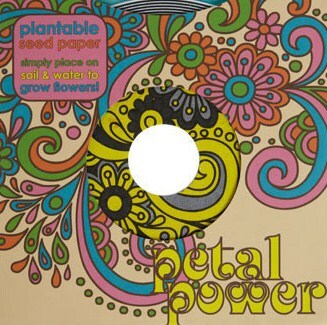 "Change the tune of your home or apartment with with these plantable paper LP’s, stuffed with seeds for an easy and unique way to spruce up your space with some ‘live’ music. Delivered in eye-popping album artwork, each fresh 45 is packed with seeds for herbs - including basil, thyme, chive, parsley, and oregano - or flowers - with California poppy, Indian blanket, baby’s breath, baby snapdragons, and black-eyed Susan. Perfectly proportioned to fill your planter, these quirky LP's only need some soil and water to get in you into the gardening groove."